Jim Harbaugh. Football coach. Former quarterback. And now, on-the-record chicken avoider. Sounds a bit, oh, let’s say paranoid. 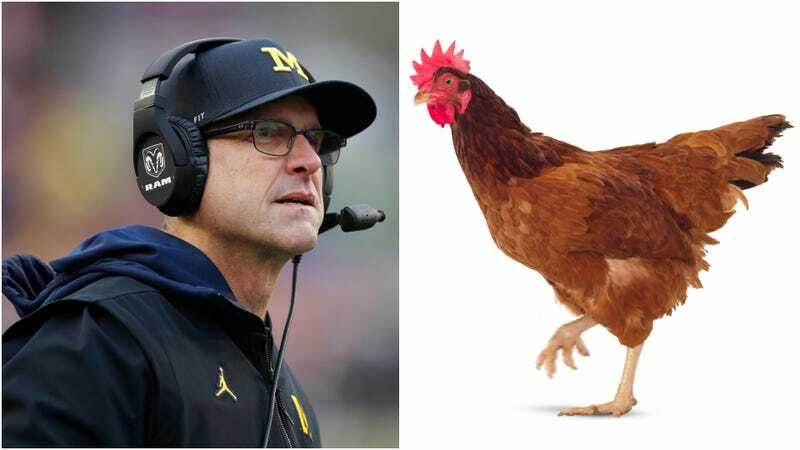 Harbaugh has had a lengthy head coaching career both in the NFL and at the college level, and is also a past Rose Bowl champion, Pro Bowl player, runner-up for the Heisman. Anything football-related, we’re willing to listen to what he has to say. But hopefully Michigan has a team nutritionist or dietician that’s in charge of the meal planning.